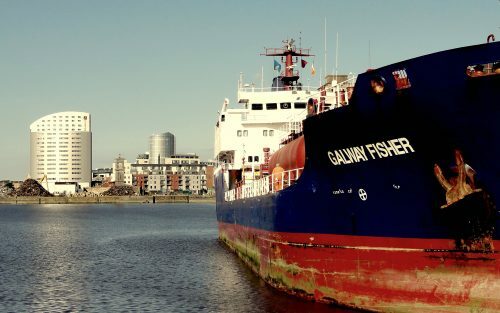 Limerick Steamship Company (founded in 1893) and Palgrave Murphy Ltd (founded in 1835) were the two leading ship owners, stevedores and agents in Ireland .They merged their interests to form The Hibernian Transport Group in the early 1960’s. This venture ceased trading in 1970. ARGOSEA SERVICES LIMITED was formed by six members of the middle management team of Limerick Steamship Company (with over 110 years of maritime experience between them) to provide ship agency in the ports of Limerick, Fenit, Galway, Ballina and Westport to ship owners who had previously been customers of Hibernian Transport Group. The first customer to sign up to the new venture was Esso and very quickly many other owners appointed Argosea as their agents in the West of Ireland. In 1972 it was decided to expand into stevedoring and ship agency in the port of Foynes. Regularly up to 200 men were employed in the loading of cargoes such as Frozen Beef, Bagged Sugar and Moss Peat in bales and the discharging of bulk cargoes like Coal, Fertilizers, Grains and Molasses. In 1976 Argosea were appointed by Ocean Inchcape to provide agency, stevedoring, warehousing and forwarding services to the new Offshore exploration industry drilling for Oil and Gas off the west coast. All the major Oil and Exploration companies were serviced by Argosea in the ten year period that this business lasted. With the opening of the giant alumina plant in Aughinish came the appointment of Argosea as agents for Bauxite and Alumina carriers at that port. In more recent times we are pleased to be actively involved in the renewable energy industry.